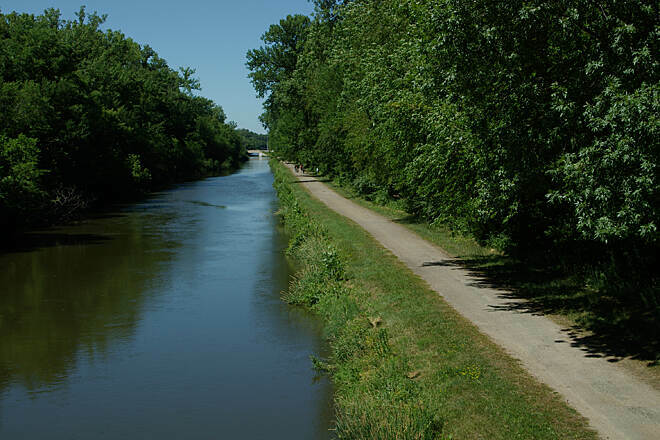 The Hennepin Canal Parkway, administered by the Illinois Department of Natural Resources as a state park, follows an old towpath along a canal opened in 1907 and quickly abandoned due to competition from railroads. 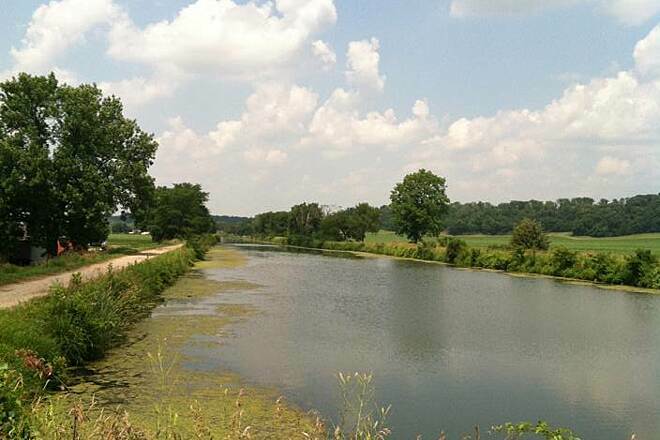 The canal was originally built to link the Illinois and Mississippi rivers. 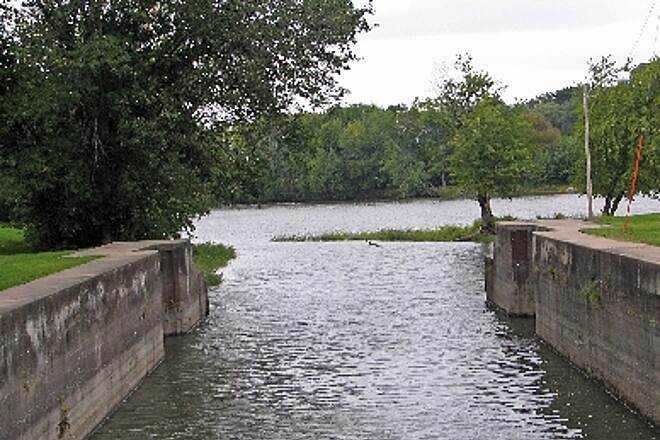 Most of the various locks and aqueducts necessary to span the 105-mile distance are still in place, and the entire canal is listed on the National Register of Historic Places. The path, which was built for animals towing boats along the canal but never used this way, is level and easy. However, water is scarce along the way (found only at locks 21, 22 and the Visitor Center), so be sure to bring plenty, especially during hot days. The landscape varies from forest to grasslands to marsh to farmland, and the trail is particularly pleasing during fall, when the leaves are changing colors. The trail surface is suitable for both road and mountain bikes, although those on hybrid bikes will have the easiest time. During winter, the canal often freezes, making it suitable for ice skating. Anglers will find stocked bluegill, crappie, walleye and bass. The east–west corridor extends from Bureau Junction, near the Illinois River, to Colona on the Rock River. 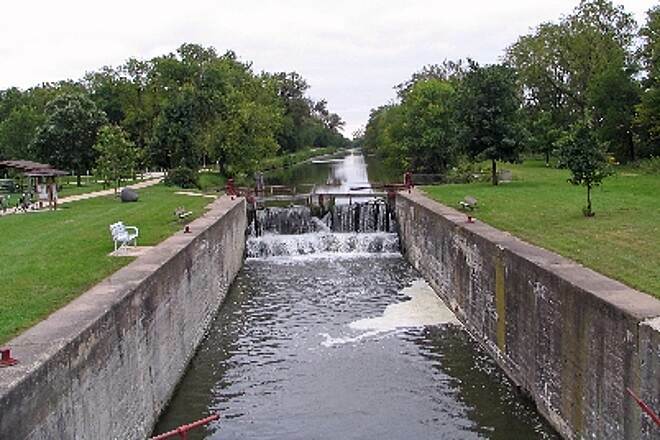 A feeder canal runs just more than 29 miles from northeast of Mineral north to Rock Falls and Sterling. Toilets are located at locks 3, 6, 11, 17, 21, 22, 23, 24 and 26, as well as at bridges 14, 15, 23 and the Visitor Center on the main canal. Additional toilets can be found at bridges 50, 52 and 64 on the feeder canal. 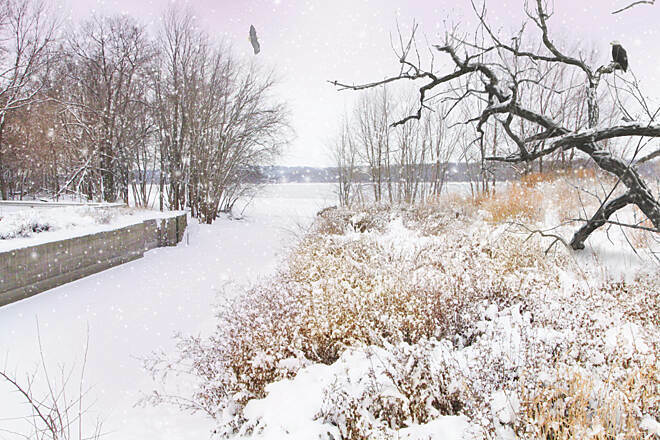 You can access the Hennepin Canal Parkway in numerous places along both the main canal and feeder canal. 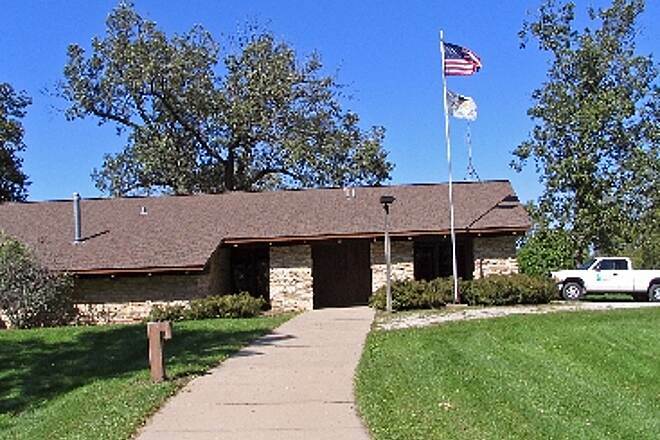 The Visitor Center is located off Interstate 80 just west of State Route 40 near Sheffield. I was on a two day ride from Kewanee, IL to Morris, IL yesterday and today (about 90 miles). 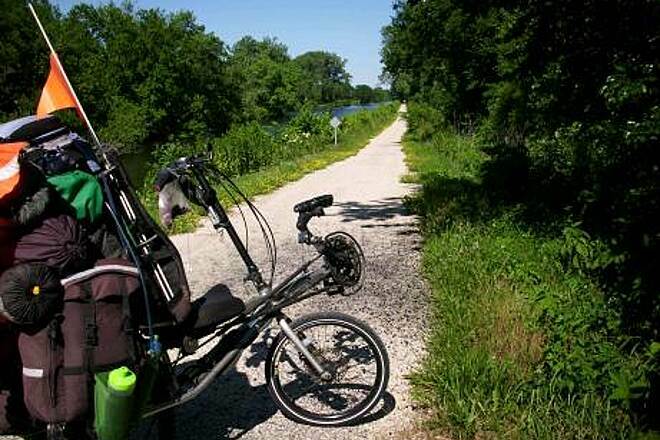 I had hoped to ride as much of the Hennepin and Illinois and Michigan Canal trails as possible (I had expected to ride about 50-60 miles on trails split between those two trails). 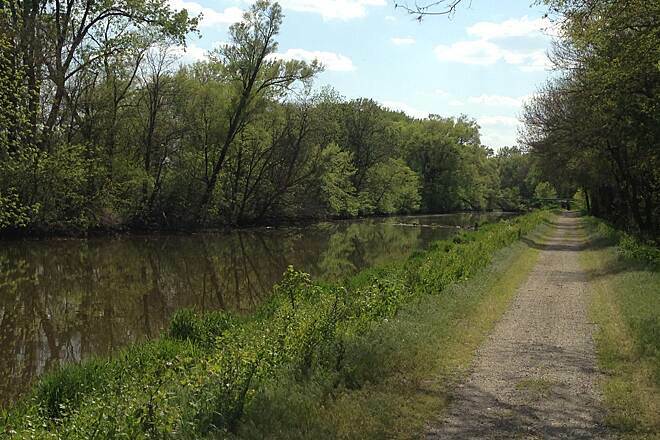 I attempted to ride both trails and have submitted a separate review of the I&M Canal trail. I only rode about 6 miles of the Hennepin Trail from Tiskilwa towards Bureau Junction (West to east). It was a disappointment. As others have written, it was rough, with some sections of old, failing asphalt. I was not in a hurry, so stuck it out for as long as I felt comfortable. It's just not conducive to a fun ride. Too rough, changing paths from side to side, and just not a fun trail to be on. If you're going in this direction, I would advise taking the adjacent road. I was on it for a considerable time one I got off of the trail and never felt unsafe with cars or trucks. I'm from Morris and have frequented the I&M for a few years now. Yesterday I went to the Hennepin for the first time ever. I started in Bureau Junction and took the canal to Tiskilwa, then transferred over to the road that follows that little river back to Bureau. The canal was great. I have a cross bike and it handled well. I wouldn't recommend a road bike with anything less that 28c tires (and this is pushing it, better bring tubes!) There were a few holes I hit. Debris was at a minimum but there was some overgrowth on the path. Nothing I would complain about. No major trees over the path. After knowing how parts of the I&M canal are I would say the conditions in this small 10 mile section of the Hennepin are a good. Especially considering how remote it is. Large hills in the background, and there are more larger oak and sycamore trees around than the I&M. The road surface conditions on the way back to Bureau were fair-good, but the places that the road takes you through are great. Not too sure if locals care for bike-riders, there were only 3 that passed me going the way I was going but I wasn't given much room any time. In either case, if you want to do a quick 20 miles this was a fun easy loop. It was a hot day and 35 ounces of water worked fine as the canal is pretty cool in the shaded areas. What a great find. Yes there is construction in the Colona area that could be marked a bit better, but if you are a small rule breaker....well just walk under the underpass knowing you might get a little mud on your shoes. Fish jumping, pretty good old black top, some gravel. Lots of places that are not marked legal to camp but a tent could be popped up readily. if you want a quiet hike, or ride, this is a very cool fit, rarely the sound of a car.....perfection. We were on it for four or five hours and came across two people both walking. This trail is closed at the Colona access; this is not indicated at the parking lot off 5th street, but rather about 1/4 mile up the trail at 3rd St. If there was a posting at the trailhead, we missed it. Had to turn around, re-load the bikes & gear. Drove to Geneseo and found access to the trail via the Geneseo Campground off State Hwy 82. This was not clearly marked. Biked from Geneseo Campground to Atkinson. If you are accustomed to paved, well manicured, suburban bike trails, this is NOT the trail for you. 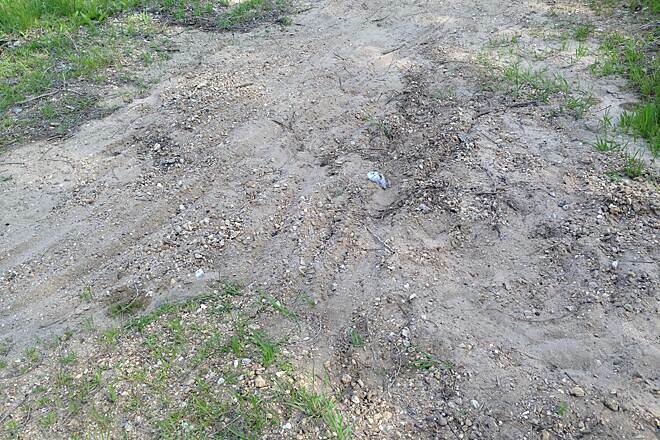 What appears to be old asphalt pavement is (as of this review) 90-100% covered with weeds and debris. Debris as in dead mice, a large muskrat carcass, two dead carp, a huge pile of horse manure and a fallen tree that completely blocked the path. Trail was flooded at one point under a bridge; had to hoist the bikes over a guardrail to get to/cross the road to continue on the trail. This was near Atkinson. On the positive: wildflowers and Baltimore Orioles abound. 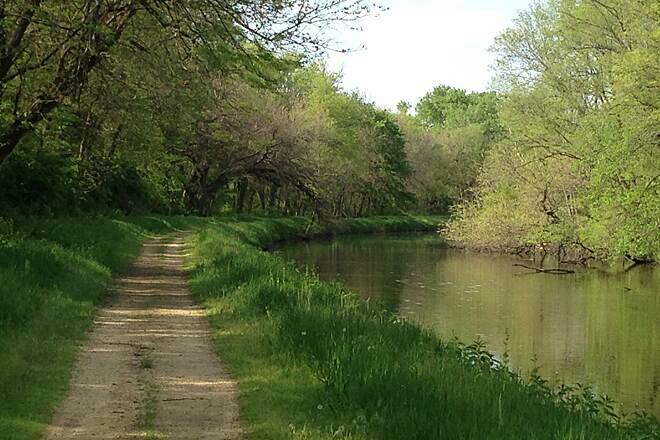 We biked the Hennepin Canal trail mid May of this year. Our plan was to ride from the feeder canal trailhead in Rock Falls, to Wyanet on the main trail. Due to an issue with transportation, we decided to reverse our route, beginning at the bike rental shop and riding west/north. We saw a lock immediately after entering the trail. 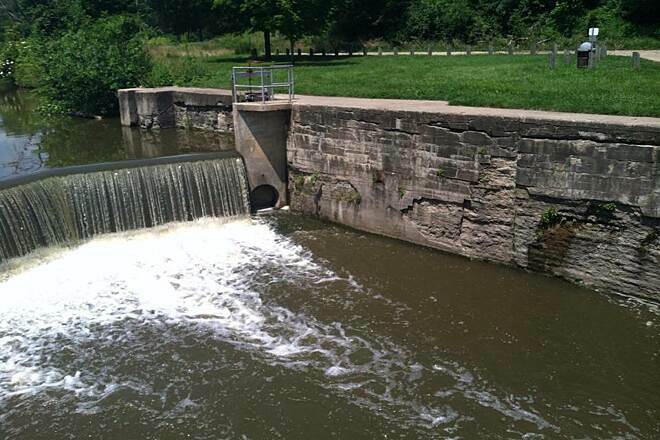 The locks are impressively built and still relatively intact except for the gates that have been permanently closed, creating a waterfall at each one. We continued on making a short stop at the visitors center near Sheffield. 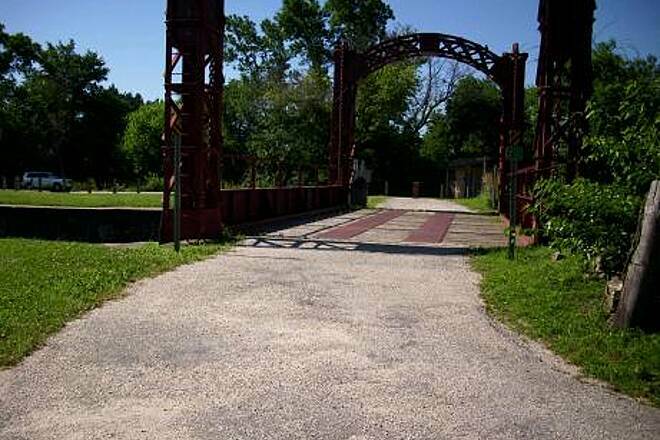 Just past the center, the trail crosses over the canal via an old iron bridge (very neat photo op). After passing under I-80, the trail really opens up until you reach the feeder basin. There are a few more trees once you begin on the feeder trail, and therefore we had to dodge several sticks & small limbs on the path, but nothing too bad. The next feature we came to was the canal bridge over the Green River; this is an impressive feature to see... water flowing over water. The trail has sections of asphalt and switched to crushed stone periodically, both of which made for easy riding. The path is fairly well maintained on the south end of the feeder trail. 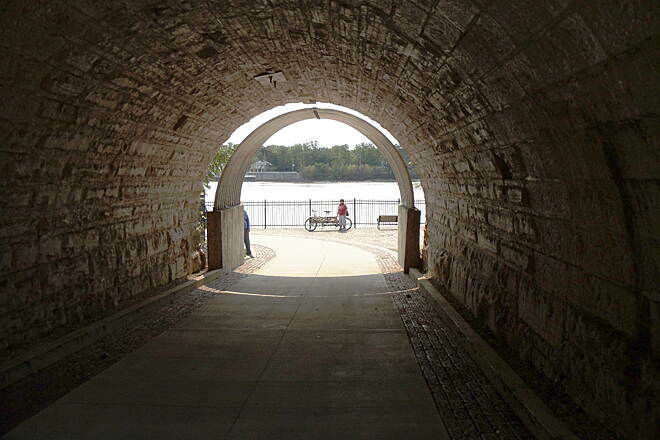 There are also many tunnels along the path that are easy to ride through. We made another quick stop at the rest area on Highway 92. After that, the trail started to be come overgrown with weeds. The first section we travelled wasn't too bad, and we thought it would clear up within a mile or two. However, after 4 miles of overgrown trail, and having to lift our bikes over two large trees that had fallen across the path, we stopped at Hahnaman Road to re-evaluate. We decided to cut our losses and ride back towards our vehicle in Wyanet, via county roads. 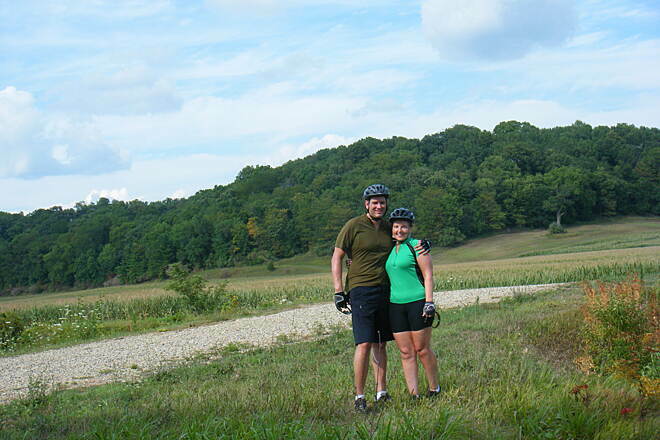 Though not as scenic as the canal trail, we did see some beautiful farms and countryside along the county highways. Overall, it was a good trail to ride, and I would recommend it to others. 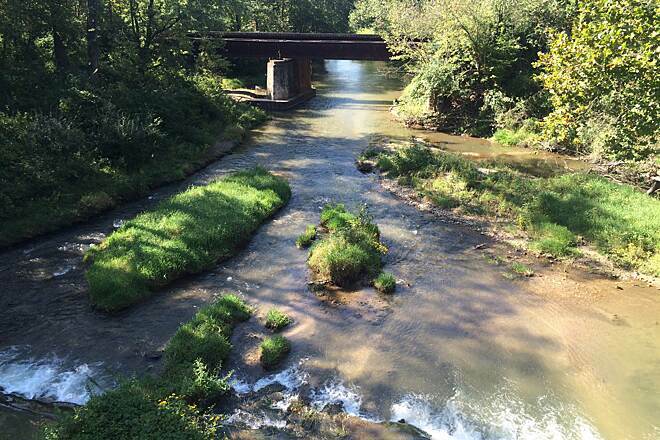 There could be more attention paid to maintaining the northern half of the feeder canal trail. We are occasional bike riders and do these rides once every couple of years. During our day on the trail, we met a total of 4 other bikers and 2 walkers. The trail was lightly used for a Saturday (there were, however, many boaters / fishermen). We had also planned to ride the Wyanet to Bureau Junction the following day, but decided instead to hike a 4 mile portion that we really wanted to see. I would like to come back and ride this trail again. 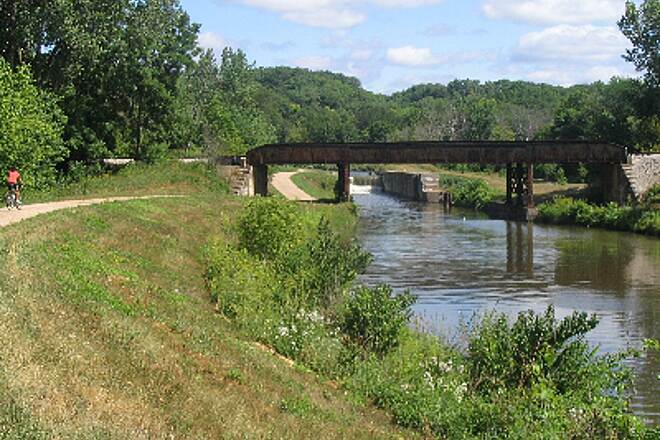 I've ridden the Hennepin Canal numerous times, most of my trips taking place between Bureau Junction and Sheffield. In some of the more remote parts, the scenery is quite beautiful and it's nearly deserted. Unfortunately, the state has not done such a wonderful job of upkeep, and significant portions of the trail are often washed out or in disrepair. It's my understanding that this is currently being addressed, and the Army Corps of Engineers recently began (finished?) a project to preserve the most damaged parts of this trail. I'm looking forward to checking it out. 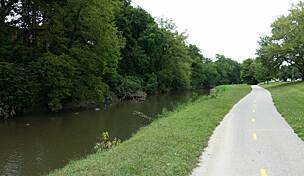 Hello fellow kayaker & Bike riders starting at the Rock River the most northern part of the feeder canal in the towns of Rock Falls & Sterling IL there are two Multi National Trail Systems that intersect. At the beginning of the Hennepin Feeder getting its water from the Rock River and flowing south 30 miles without any portages and a bike trails running adjacent to it makes for some relaxing, private secluded rustic riding and kayaking. At this intersection where the Rock River flows into the Hennepin Feeder you will find plenty of kayaking and biking and fun. These two trails are both National Trail systems. 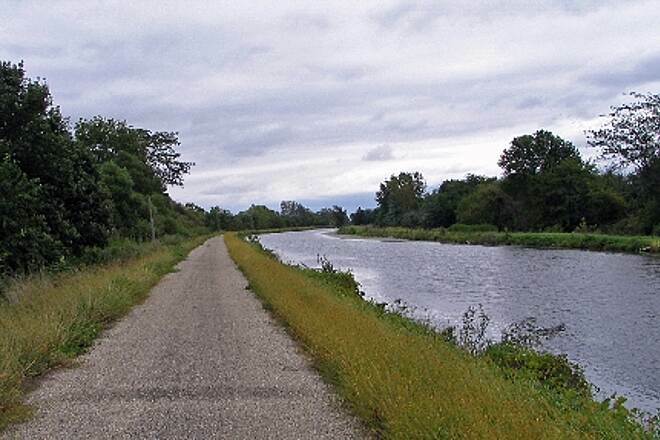 The Rock River was designated as a National Water Trail and is also a bike route and road route. (www.Rockrivertrail.com) Full maps of the Rock River see web site. 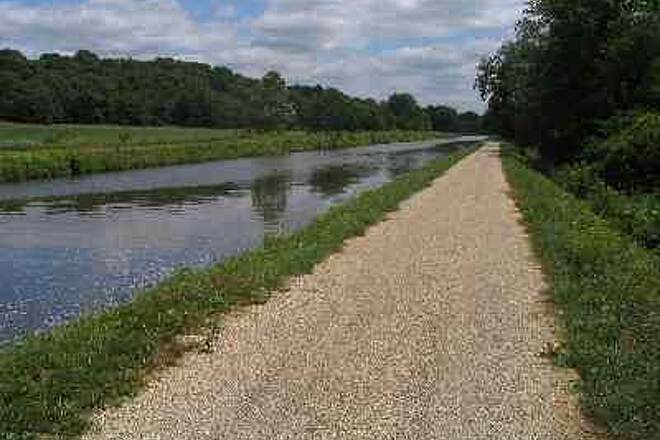 The Rock River Trail connects to the Grand Illinois Trail System. 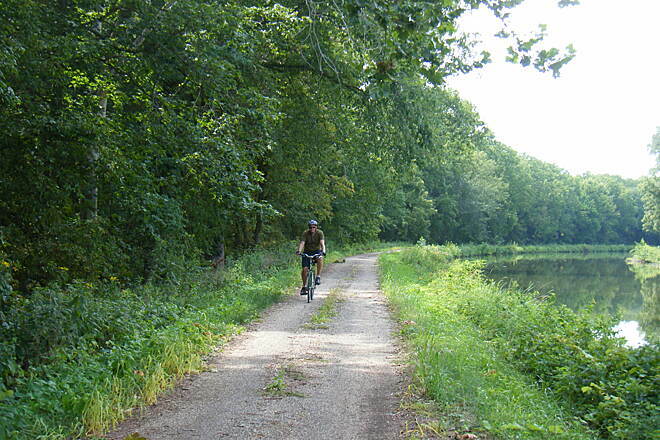 The Hennepin is a National Multi Recreational Trail system of over 104 miles. (www.Friends-hennepin-canal.org At this intersection in Rock Falls IL you can cross the Sinissippi Walkway Bridge over to Dillon Home Museum and then onto Sterling Trail system of about 2.5 to 5.0 miles along the Rock River through Sinissippi Park where there is a Historic Burial Ground of the Mound Builder Indians.Bathrooms, water and shelter here. This is a beautiful trail all newly paved in 2014 coming across the walkway bridge under the railroad through a tunnel and 2.5 miles along winding curves and along the banks of the Rock River into Sinisiipi Park. One or two good hills but mostly flat coming out at Hoover Park Parking lot.back to the Hennepin Canal Trail going south from the Rock River. paddling is beginner type as the current at times is hardly noticeable and depth is about 2 to 5 ft throughout with the occasional branch or limb to maneuver around. Trees on both sides like a canopy bike trail running along side. You will never have to get out and walk as there is plenty of depth. Not many places for water of bathrooms . The banks are covered with a lot of poison Ivy so be careful. bring plenty of water and snacks for this 30 mile adventure.kayaking through culverts of about 5 ft high and about 8 to 10 ft wide are unique to the Hennepin Canal when they removed the bridges. At times these can have some spiders in them. We are working to get these cleared. No camping along this stretch of 30 miles. This trail is not perfect! But it offers a great mountain bike ride and beautiful scenery and a since of being all alone and away from the world. I think what makes this trail is that there are different surfaces and obstacles and has the since of unpredictableness which is intriguing to me and exciting. Very rideable trail for those that are not looking for a perfect paved trail but a very relaxing and peaceful and a feeling of getting away from the world. There is a stop along the way on the feeder about 1.5 miles west into Tampico IL the Birthplace of Ronald Reagan with a bar & Grill Convenience store and really cool Birthplace to see. From Rock Falls heading south Tampico is about 13 miles south on the trail. No Signage here.paved road into Tampico. 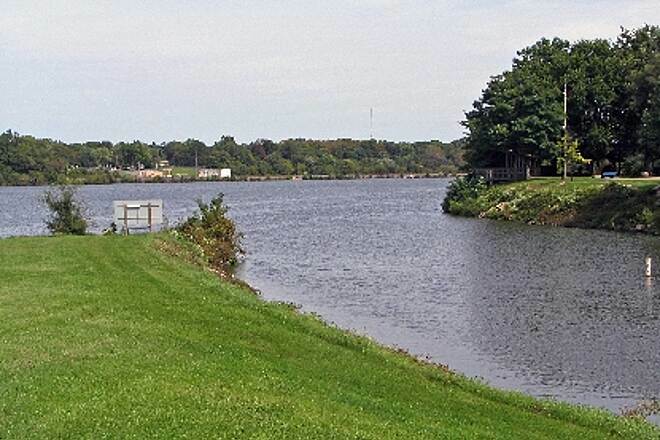 At the Southern end of canal where the feeder feeds into the main canal you will find the IDNR visitor center park. Camping , shelters, bathrooms and a small Museum of all the old pictures and materials and tools used on the Hennepin Canal. 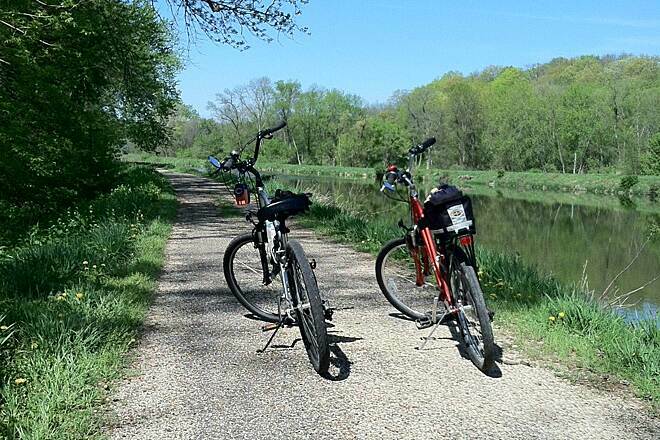 A friend and I road the Hennepin Canal trail from Bureau Junction to the visitor center near Sheffield. It was a 42 mile round trip. This was the longest I had ever biked. The trail was a mix of older blacktop at the start. Then is was mostly crushed gravel. The grass along the trail was cut the entire length. But be prepared to work a bit and avoid some potholes. There was only one small partial washout that I remember. A larger washout area nearest the adjacent river was completely repaired. I would say the surface was pretty good over all that distance. 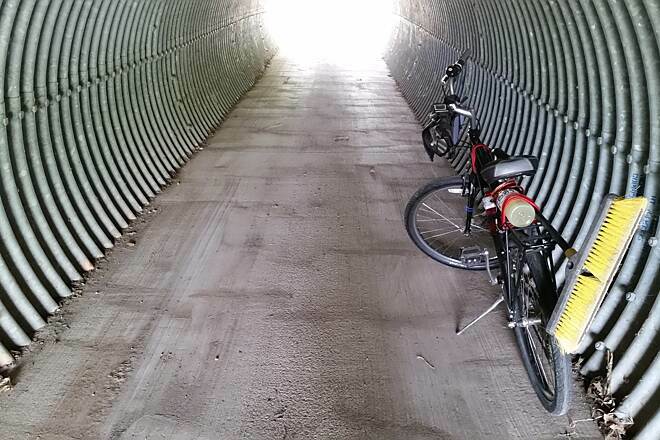 The first underpass you come to is dark and unpaved. You are best to walk that one. The rest are concrete and can be ridden. We started at the lower elevation which makes the trip back a bit easier. There are about 20 locks that are sealed up and act as waterfalls now. You see them pretty good heading west. The trail runs along the water the whole time. The adjacent river is visible on the other side of the trail at certain times. Please be aware that there are very few amenities on this trail. All the small towns are a mile or two off with little if any services. The Sheffield Diner near the expressway by the visitor center is closed. Bring food and drinks in a backpack to be comfortable. There are several places to stop for a picnic or even camp along the trail. We also found that the visitor center is only open Monday - Friday. The trail was not busy at all for a Saturday. We only saw four other bikers the whole day. We did see lots of Grey Herons, butterflies, some turtles, swimming snakes, muskrats and/or beavers. The adjacent farm county is visible at certain times also. It was a fun day but go with friends and bring eats. My wife and I ride a tandem, single speed and have found that from Sheffield to Annawan the trail to be badly overgrown and rough. Have also ridden from Geneseo to Colona, the trail is 99% paved, level, smooth, and a nice ride. We love this bike hike path. It is a national treasure with its aqueducts locks and lift bridges. We have ridden it for many years and each year it gets worse. What was once an 8 foot trail is now barely a foot in many places. It would be nice if the state would repair this beautiful trail with wonderful birds flowers and wildlife. The aqueducts themselves are something most people never see in their lifetime. They are a building marvel. I know there are grants both government and private that could be applied for to help the repairs if only an official would do it. 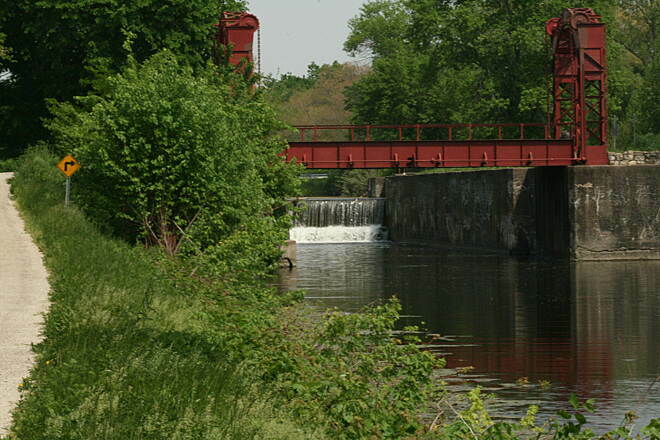 Feeder Canal from Rock Falls to the main Hennepin Canal. 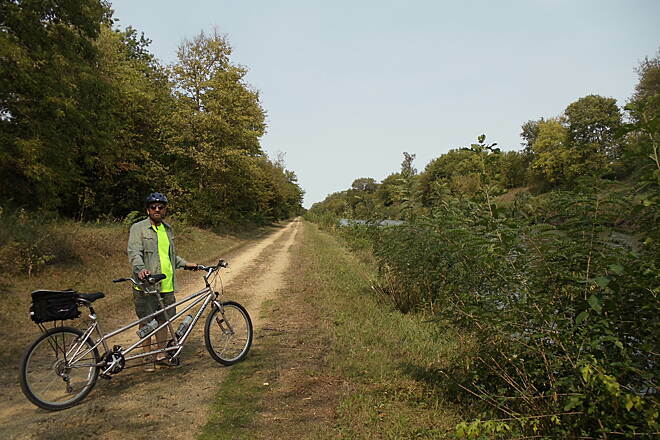 I’ve been riding the Hennepin Canal for several years and each year it gets a bit worse. The area south of Rock Falls to Rt. 172 is not too bad. The area between Rt. 172 and Rt. 92 is becoming overgrown with grass and weeds. I’m not sure if the DNR is doing much to maintain this portion of the canal. There are about five corrugate tubes between Rt. 172 and the main canal. I spent two days clearing them all sorts of debris. Someone malicious individuals have lined the inside of these with large rocks and if you were to ride from the bright sunshine into the tubes, which are dark, you have an excellent chance and taking a major spill. So it is best to walk you bike through the tubes. The area south of Rt. 92 to the main canal, is in a lot better shape. It is paved (tar and chip) for most of the way. There are areas of buckling and sink holes so you must pay close attention to where you go. 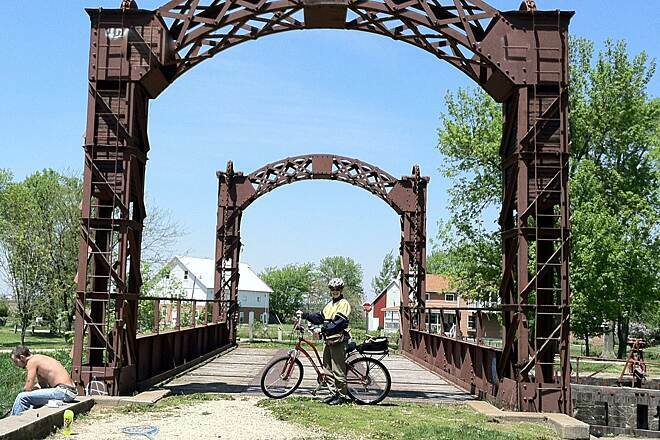 It would be wonderful to see a bike path/spur into the Village of Tampico IL. It would also be nice to see a fresh batch of limestone in the area between Rt. 172 and Rt. 92. On the way back from helping a friend move, I was hauling an old 1973 Sears 3 speed. I happened across the canal where it crosses Rt. 92. I rode from there for about 5 miles. Rough, but real scenic. I'd ride it again. Hi fellow trail seekers and recreationalist. See my web site for videos and pictures of the Hennepin Canal Trail System at www.Davesoutdoorworld.com click on local attractions/Historical or video page and rental page.look for my you tube videos under Daves Outdoor World.I have lived in the area all my life and grew up on the Hennepin Feeder Canal in Rock Falls. 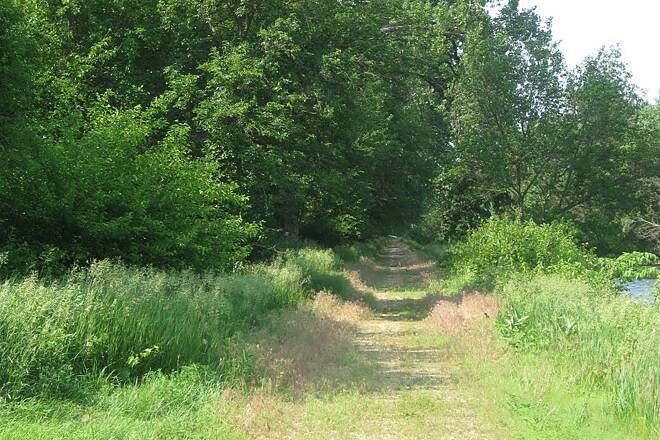 This trail is not perfect paved for the first three miles from the Rock River to buell rd. After that its mowed short grass, limestone or chip rock and dirt paths.trees on both sides lined up against the path like a beautiful canopy giving you the feeling of peace and quiet away from the fast paced life and city.The bike path hugs close to the water and you get a beautiful view of the scenery as you ride going through tunnel culverts that they used to replace the over passes. 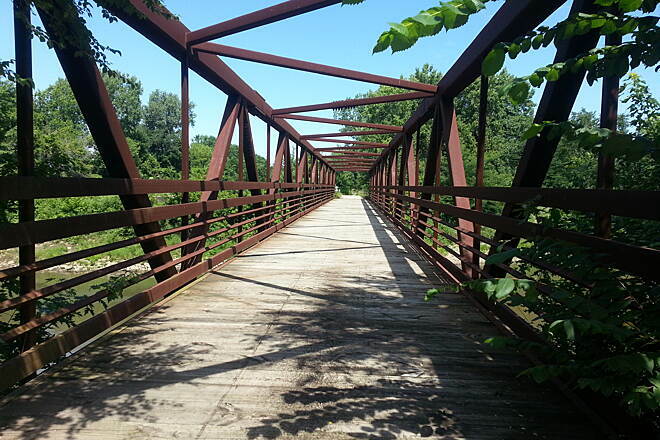 The feeder is 30 miles of bike trail and kayaking trail with no portages for the kayaking. Awesome but in disrepair. Needs the funding the I&M got. The head of the trail at Bureau Jct is technically "closed" for about 4 miles because the trail is 80% washed out for about 100 feet. It is passable if you walk your bike or take the horse trail on the other side of the canal to bypass this area. It looks like the creek running next to the canal will compromise not only the trail but the canal berm itself in a year or two. I'm not sure what happens to the canal water levels after that. This first section of the path is very rough. Old, tired asphalt that is buckling, weed grown, sink holes, etc. It gets a little better past Tiskilwa to Wyanet where I turned around. Wide tires would be recommended and kids under 10 might have problems staying upright. I only saw 3 other bikers on my weekday ride and several fishermen. As others have said, there is camping along this stretch with pit toilets but no water. Provisions have to be found in town. 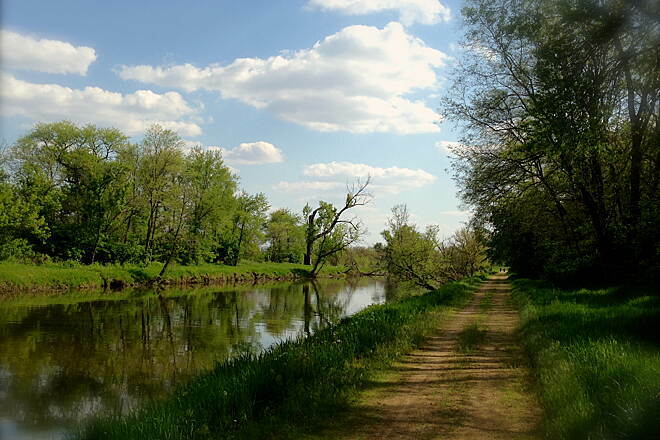 Though there are trees on both sides of the canal, there is no canopy to provide shade and block the wind. The bike trail is on the south side of the canal and there is a mowed grass horse trail on the north side. There are mile markers at bridges, locks, etc. Check out the asian carp jumping the dam at the Bureau Junction lock. It looks like they only get to the next lock since I never saw another one after that. Wildlife is abundant: orioles, indigo buntings, herons, BALD EAGLES (very cool), deer, muskrats, etc. 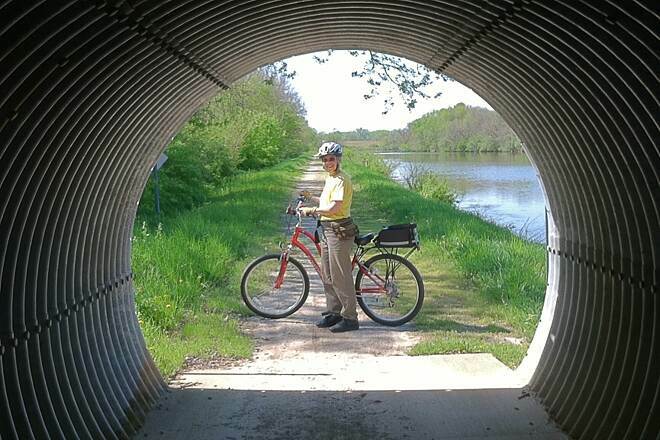 After riding the I&M Canal Heritage Trail the day prior from Channahon to Morris, one realizes the enormous educational and recreational potential of Hennepin. But given Illinois' political and financal morass, it will never be realized. Enjoy it while you can. I picked up the Hennepin Canal on the eastern trailhead (Bureau Junction) and took it to the Visitor's center. Having recently done this section of the canal before I was getting a little bored and tired of the crushed limstone so I accessed a random north/south surface road (running east of the north branch canal) and make my way to Tampico. From what I could tell any of the secondary roads would have been good choices as they are all well paved and lightly traveled (I saw more tractors on the road than cars). From Tampico, after visiting the President's boyhood home and the Casey's for food, I headed out of town East on Tampico Road to Indian Head road, then weaving a path down to Princeton, again on secondary surface roads, which provided a great ride with very little traffic and nice farmstead type scenery. All in all, if you have a road bike and looking for low traffic, well paved roads I would highly recommend exploring the area between the visitor’s center on the Canal, Princeton and Tampico (most of these roads have been mapped on on Google streetview so this will give you some idea ahead of time). I rode about 10 miles south from Rock Falls and back. It's a beautiful trail but a little monotonous. I was on a road bike, but would have been better off with a bit wider tires. The first 3.5 miles are paved and the pavement is a bit bumpy in spots. Most of the rest of the trail was crushed stone, with a few sand traps (!) 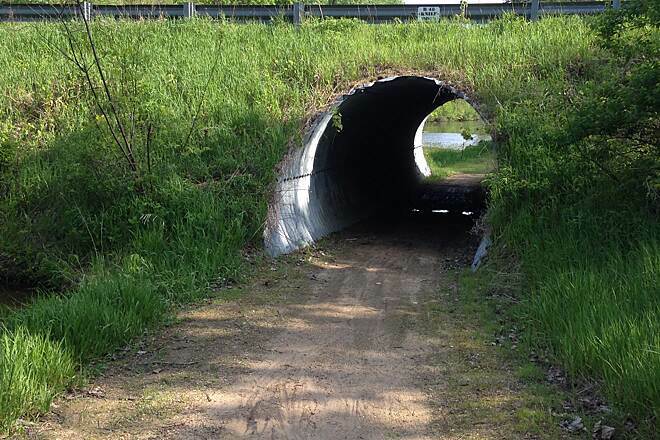 and mucky culvert-style underpasses. I will go back with my cyclocross bike for a longer ride. i rode the trail picking it up at bureau and ending at colona. i was on a road bike running gatorskins 700x25s. in general the trail is very doable with a road bike and people thinking about doing this ride should not be deterred. there were a few spots of the trail, particularly the first 10 or so miles that were particularly rough (washouts, rough terrain in and around tunnels, etc). another think to note is there are almost no places to stop right along the trail. i ended up stopping at hodgkinson (sp?) for a bite to eat which was about a 5 mile round trip trek back to the trail (although I ended up taking highway 6 down to geneseo (sp? ), then cutting back toward the trail via chicago ave. all in all a fun trip but be warned there aren't a lot of services along the trail and a few rough parts. Rode this trail for a 2nd time and have a lil bit addational info. 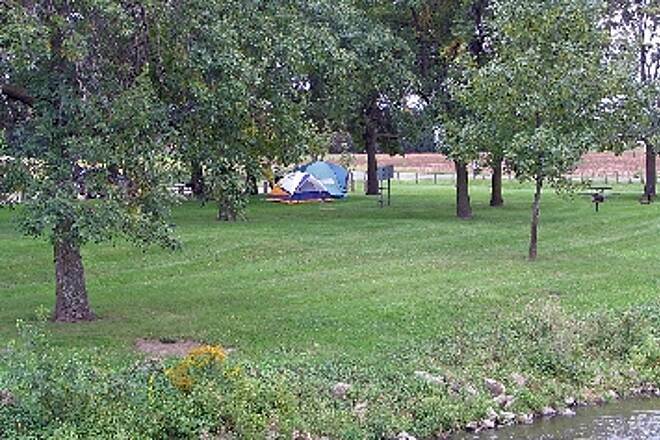 There is camping along the canal, if you stop at one of the many parkiling lots/locks you will find a map that tells you specificaly where you can camp. For this trip I campted at Lock 17. It will cost you $8.00 a night to tent camp if the "park ranger" comes out. Still no real reliable water source unless you stray from the trail and hit a small town. Again I rode into Wyanet and stopped at the local "Caseys" gas station. Depending on where you are the trail is decent to great; meaning there are a few sections that are slow go due to it being beaten up by horses, but for the most part it's a good trail of hard pack gravel or pavement. There is one section just out of Colona where you'll see a "Trail closed" sign; there is a huge wash out but you can easly manuever around it by dismounting your bike. 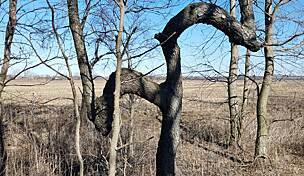 There was also a HUGE downed tree about 8 miles out of Colona, again, I dismounted and climbded over it. The views are great, I saw all kinds of wildlife. Saw lots of fish in the canal at verious locations if your into fishing as well. 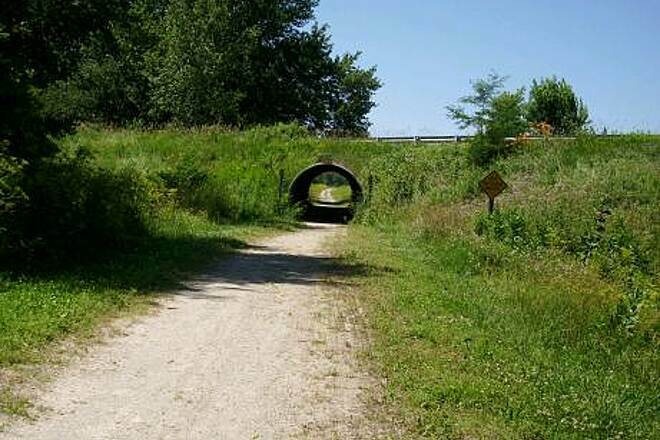 I started riding this trail in Colona and went west to east all the way to Waynet, about 47 miles. One thing to note is I didn't come across any "reliable" water sources at except for Geneseo Park (12 miles). 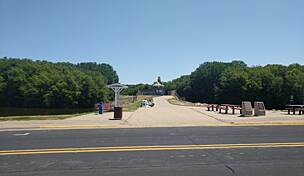 There is a Caseys Gas station 1.4 miles off the trail in Waynet, the trail is marked with a sign telling you 1 mile to Waynet. The so called Visitors Center IS NOT open on Sat/Sun and the hours during the week are only 8am-4pm. I would think looking in the windows that they have running water inside. You'll see signs along the trail saying no overnight camping but I camped and saw many campers at the numerous parking lots along the trail. The views are pretty good and for the most part it's secluded. You'll cross over a few back roads and go under an interstate but you won't see much traffic at all. The trail itself is rideable on a road bike. Only one washed out section would require a road biker to get off and it's only maybe 50 feet long. I highly recommend this trail to anyone wanting to get out for a few miles or so the distance of the entire route. I'd give it 5 stars if there were more accessible water points. from Geneseo (not sure of spelling) to Bureu il. I loved this trail. No its not made for a road bike, but on a fully loaded long haul trucker, pulling a bob trailer i had no problems. There are places along the trail where it becomes more single track than "trail", but with any size tire other than a road tire, you should be fine. And there are sections where a road tire would be fine. My only complaint is that its very poorly marked. I never really knew where i was on the trail. I never knew where the towns were, and felt this is part of the reason its not used more. Which is a shame because its a beautiful ride and a great bike highway across Illinois. 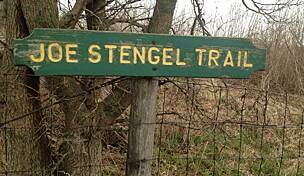 If you start your ride in Bureau, IL and head west - the trail is a compacted recycled asphault for quite a few miles - at least past Tiskilwa. The state has a sign up saying Trail Closed for the first part due to a couple minor washout areas from 2013 Spring flooding but they are just a few bumps and 2 or 3 small washouts on the canal side of the trail that do not go past 1/4 of the trail. 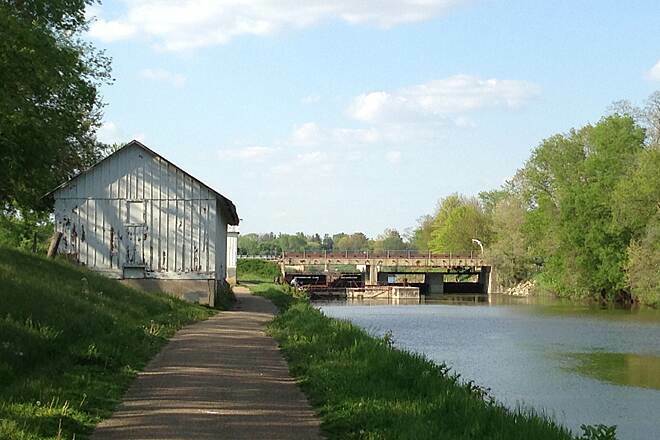 I have rode the trail from Bureau, IL to Wyanet - where the Wyanet/Walnut Road crosses the canal and it is all beautiful. At some point the trail turns from recycled asphalt to a fine white sand? It is still very easy to ride on - however I do have a wide tire bike. I would highly recommend it to anyone looking for a nice shorter ride. I started in Colona IL and headed east. In the town of Colona, the path is kept up very well. Once you get past I80, things take a turn for the worse. There is also a sign before you go in the tunnel below I80 that says that the path is closed. The bad... The state of Illinois clearly doesn't have a budget at all for this path, as it doesn't look as if it hasn't been kept up for several years now. There are numerous washouts from the Green River and some of them are out right dangerous. It's very sad to see this, because it clearly used to be a very beautiful trail. There is one nice spot that I did enjoy and that was the Green River bridge. Outside of this, I'd avoid this path, unless your willing to walk your bike a few times. This trail is way over rated for use as a bike trail. Especially for road bikes. My wife and I spent half a day searching the east end to the Visitor Center. There are no sections conducive for a nice road bike ride. Even after talking with a Ranger at the office we found the trail impassible just 4 miles west of their location. The "surface" is choked with weeds and in several places completely blocks the path. The final straw was nearly crashing into a sink he covered by over grown weeds. An anxiously awaited 60 mile ride ended up being barely 13 miles and part of that was spent walking the bikes. DO NOT PLAN A ROAD BIKE RIDE ON THIS TRAIL! Started in Colona at the Rock River and planned a 3 hour ride. Colona section beautiful and park like, after that older signs saying trail closed. Because we had seen the trail on this site we continued. Plenty of washouts from the Green River overflowing, I think. Walked bike3 times then left the canal and went thru the countryside. During the second weekend in October, I rode the Hennepin Feeder Canal from Sterling south about 20 miles. The landscape was beautiful: the peaceful canal was lined with large trees with delicately colored leaves--though many had already fallen. The path surface, however, presented some problems. For example, there was a significant amount of clutter on the trail, especially fallen branches--at one point a fallen tree completely obscured the path. The second problem was that for the most part, only one side of the trail was well traveled. Third, the farther south I rode, the more the canal encroached on the trail and significant erosion could be seen. In some places the erosion was so severe that a momentary lapse of concentration could easily take a rider down the bank and into the canal. There are occassional little parks along with trail with bathrooms, but no water is available. And no camping either. I chose to do a little stealth camping on the grassy tow path that runs along the eastern side of the canal and it was beautiful. It rained the whole day of my return, and rather than get bogged down on the bike path, I chose to ride on highways back to Sterling. In so doing, passed through the only town close to the trail--Tampico, IL, the birth place of Ronald Reagan. Tampico has seen better days. Although full of interesting history, many of the buildings on Main St. are closed, and even the home where Reagan was born is for sale. In the only gas station/grocery store, I heard a lady talking about how hard it was for their church to find a new pastor because they only have six families attending. Nevertheless, if you have chance, Tampico is an interesting place to stop. 8/22/2012 I rode two sections of the trail. The 1st was from Hickory grove Campground, just a few miles west of the visitors center, to the end heading east. I must say the trail conditions were excellent. The trail is made of a combination of asphalt or hard packed screening/stone. about 50/50 on the parts of the trail I rode. A nice shady trail on this part. Camping areas looked very nice, and free! The next day I went from Genesco to the western end. Again the trail was in great shape, except for where the bridge is out. There is a sign saying the trail is closed about ~5 miles from the western end. I kept going anyways and found 1 bridge out, but a short detour (hilly) and back on the trail. A very few other parts of the asphalt trail were washed away, but at least 1/2 of the trail remained. The only part of the trail I didn't like was about 1/3 mile of occational loose sandy screening. The bike gets a little squirlly over these areas. But all in all I really like this path. I went on a Wed/Thur trip and only seen 3 bikers and a few fishermen at the locks. I had it all to myself. Very nice. I've hiked, canoed, or biked the entire feeder canal, and most of the main canal. I have to agree, there is not much in the way of provisions and there are a few towns along the way close enough to be convenient. The most frustrating part if you decide to camp or ride on a hot day (especially in the summer), is the lack of places to get water. There are sporadic camping areas along the canal (none along the feeder) but most have no hydrants. I think there are only a couple locations that actually have a hydrant, one is the visitor's center and the other is a camping area (forget which lock) approximately 5 miles east of the visitor's center. If you get it from that one you may still want to filter it. I've taken it from there and it looked like it came right from the canal. I would not recommend taking water from the canal even if you filter it. The most scenic area for the main canal is the eastern corridor. During the Spring some spots get a little washed out and you will see maintenance crews from time to time working on it. There are signs near Bureau indicating the canal is closed in that area. Most locals just ignore them and continue to use it (probably knowing the signs were put up and simply forgotten about). Anyways, about the first 10-15 miles, it's mostly forested on either side. I have seen lots of water fowl and birds of prey along the route. Snakes, turtles, coyotes, and deer. The early morning is the best time to see the wildlife moving about. In the evening you will likely hear coyotes howling (only heard them near the east end). I've had one get within 30 feet of a campsite I was at one night, It was in the woodline, i first notices its eye glowing from my headlamp, I was able to scare it off. From what I've seen of the western end (west of the visitor's center), mostly cornfields and old farm homes. Still camping areas along the way, but the scenery does start to get interesting again on the approach to Geneseo, and if you like to fish, the smallmouth population is pretty good. My best trips on the canal have always been in the fall. I rode this trail from the Visitor's center east to Tiskilway. Not a great trail by any means. I don't know where some of the posters get that the trail is entirely surfaced, IT IS NOT. On the day I rode It was extremely hot. There is absolutely no shade on the trail. If you don't bring supplies there are no towns along the trail unless you ride a couple of miles or more. One town is close but only the desparate would try to climb the hill to get to it. The only place I found the trail surfaced was for about 100 feet each side of the access points. I saw absolutely no wildlife except for Canada Geese. It rained the day before I rode and the trail was soft and had numereous washouts. 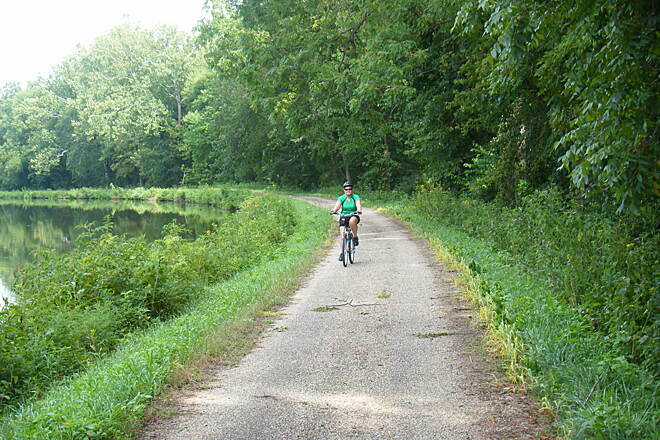 I have ridden the I & M (Illinois)and C & O canal (Maryland) trails both are much better choices. The I & M is just east of the Hennepin trail. Save this trail for the cooler weather in the fall. Maybe the north/south section is better. Great trail, but NOT flat. My title sums up this little article. 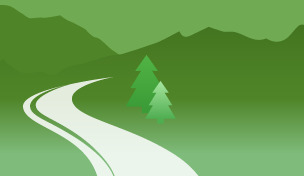 It is a great trail, pretty and lightly traveled. you can see that the starts at the eastern end at about 450 feet above sea level. then decends to about 550 feet above sea level at the western end. 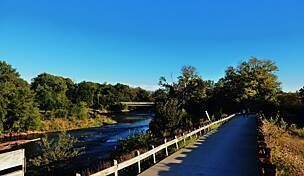 I have ridden the HCP twice in the last three years, which was a return to my late mother's homeland around Geneseo. Stayed with family that still lives in the area about the canal, and one of my uncles' grandmothers even cooked meals for the construction crews when the trail was initially dug! I rode the trail in October and in May, in that order in two different years, 2007 and '08. The first time alone and the second with an old college days friend. 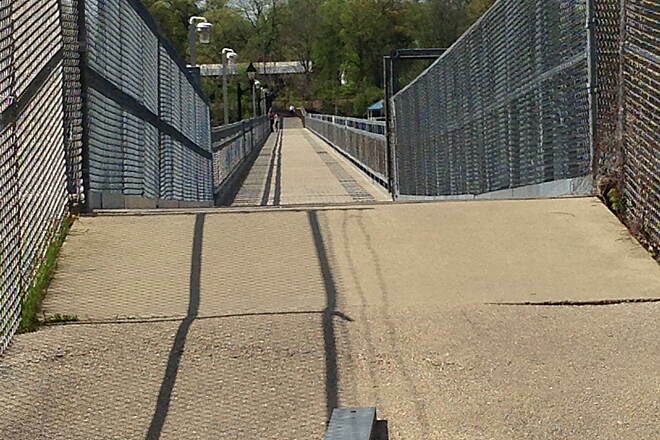 The trail is crushed stone and a thinly bonded aggregate surface, but well maintained, in the main. Several of the old mechanical lift bridges have been restored and the locks still exist but they are no longer operative and have been converted into water falls, presumably to aereate the water for the aquatic life? Much in the way of wild life exists along the length of the trail. In my second ride on the canal, I rode the entire main canal length of some 74 miles in two days. The primary complaint was the prevailing east wind that happened to be blowing (an anomaly with respect to usual west-to-east flow). I stopped along the way to photoshoot and hydrate. Many of the old iron bridges still exist over which, some 40 years ago, I would drive heavy farm machinery when staying for summers on my uncles farms. I shudder to think of doing that today on them! The Visitor's Center is a jewel and has an education and information section second to none. The staff is helpful, warm and cheerful and provide willing service to all who visit. the VC is near Sheffield. 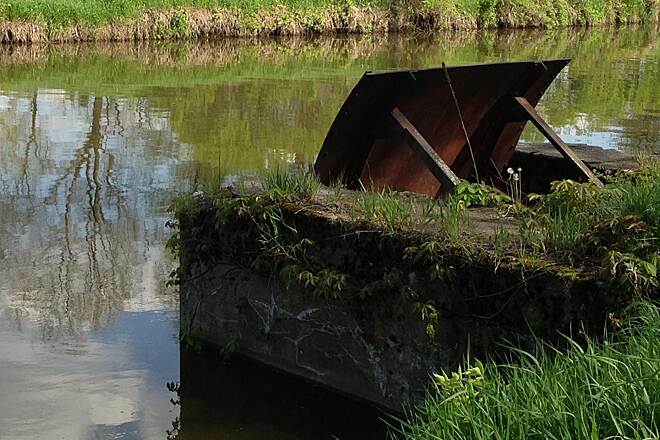 I have yet to ride the Feeder Canal, and that is a goal in the offing. It would be a good day's ride from Annawan, when my aunt and uncle live. A nice side trip, given sufficient energy, would be a visit to the Ronald Regan Presidential birthplace at Tampico, Illinois. However, that awaits another familial visit with my newest MTB. The first two bikes have traversed sections of the trail, the new one has yet to do it. Provisions along the trail are wanting. The rider is well advised to have panniers and bike bags sufficient to carry along water, power bars, banannas and the like since there is very little in the way of ammenties along the way. The HCP misses most communities, and one has to leave it to obtain such services, but one can. The ride is virtually flat, given that it is a canal way. It falls away from the center both ways to the Illinois River to the east and the Mississippi to the west. 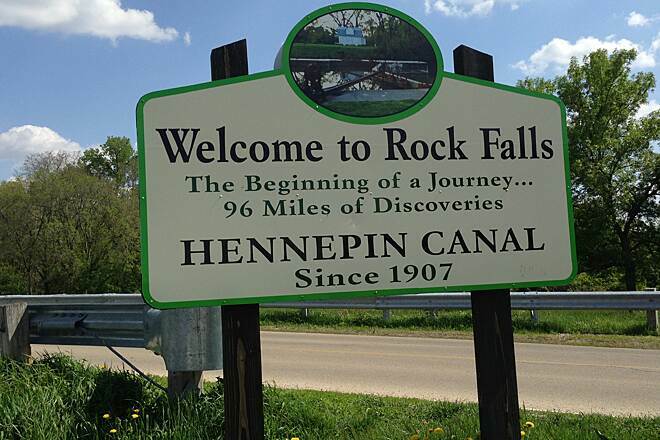 The main pool is near Mineral, Illinois, where the Feeder Canal intersects the Hennepin from Rock Falls. The eastern ride is the so called, "Historic Section," and has more locks on it. Unfortunately, one can not go all the way to the Illinois River and Lock #1 because it is blocked by private property (a gun club, so don't mess with it! 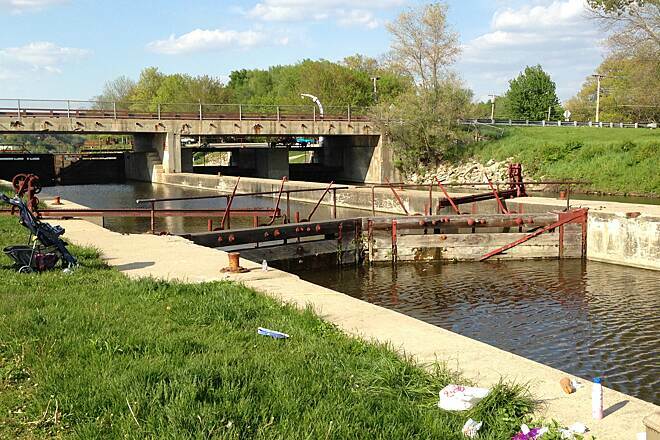 ), and the fact that Lock #1 is under the river anyway! The western end stops at the Rock River, but some segments, broken up by roads and development, are in place beyond it, but one "can't get there from here!" This is a jewel in Illinois' crown. It's a great ride, but one that has little ammenities. Take your own and enjoy this long, long trail. "In mid September a group of Wisconsin retirees camped along the trail and rode the western section from the visitor center to Colona. We camped at the Lock #22 campground. On our first afternoon after setting up camp we rode north on the Feeder Canal from the Feeder Junction Basin to Bridge #59. The next morning we took our bikes to Colona and rode east back to our campsite. This was a great ride and very picturesque. The trail surface is in good shape and the day use and camping areas are well maintained. The locks and bridges, many have been restored, are very interesting and fun to explore. 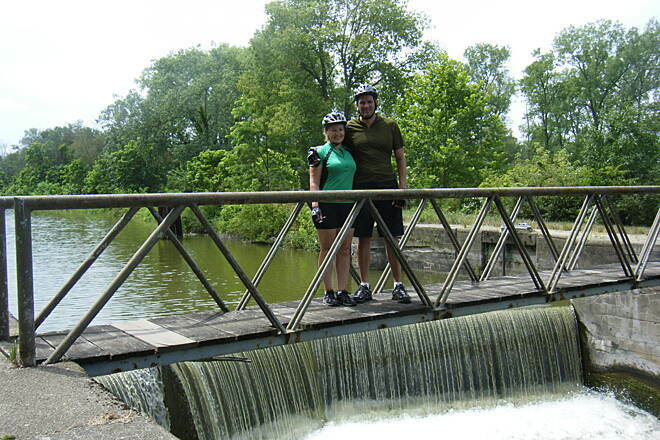 Next year we will return to ride the eastern section of the Canal." "I ride the canal trail once a week. Since all these reviews, the canalway has been completely resurfaced with oilχp and/or limestone screenings --the entire stretch of the canal. It makes for smooth riding, although west of the Visitors Center, there is still a little loose chip that should've been swept away...it just ups the difficulty a little. Go and enjoy!" 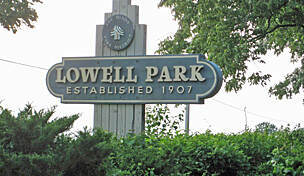 "In September of 2004 I parked at the nice parking area at Route 29 where it crosses the Hennepin Canal. I had my Camelback Mule strapped on, and I had my iPod rocking. I had no particular mileage in mind, although it was in the back of my mind to walk to Tiskilwa and back. For my age, condition, and shoes, this turned out to be a bit more than I should have bitten off as I had very stiff legs towards the end. I can only say that it was a wonderful experience, complete with shady portions, sunny stretches, and there is always that canal. I saw some water mammals at a distance so I cannot say if they were otters or beaver, either is possible in that region, I think. They were too big for muskrats. Some great old trees quite near the path, probably survived the years because so close to the canal, otherwis they might have gotten chopped. So I made it to Tiskilway where I drank a real big bottle of Gatorade and went back to the car. It was maybe 18 miles of walking or so. I was wishing for my bike, but that was somewhere else. 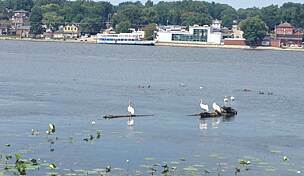 I grew up in the area, down in Chillicothe right along the mighty Illinois, and I never knew this canal existed, although in those days it was abandoned and the revitalization effort had not yet begun." I rode the full length of the main canal the first weekend of August. It is now fully paved. Most of it is oil and chip with some sections crushed limestone. The surface is still a little slow because it is so new (they told me in the trail office they have to wait a year to roll it smooth). I rode it with a hybrid bike with touring tires. It's a great ride through lots of open farm country. It is a pretty sunny trail though there are places were it is shaded. From Bureau Junction to the Feeder pond is a long uphill. 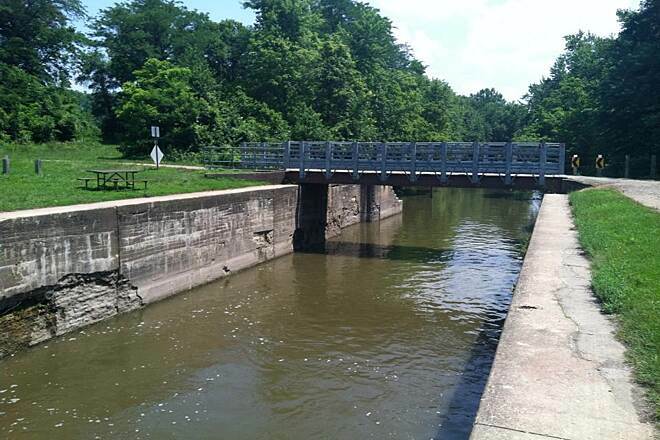 There are 21 locks in this section and the canal climbs nearly 200 feet. The western portion is a lot flatter. There is a lot of wildlife. I must have seen a hundred blue herons. Lots of smaller birds. I camped at the Geneseo Campground right off the trail. Very clean and the owners were extremely helpful. There is food available in most of the towns along the way. There is a good diner just over the I-80 bridge in Anawan. Highly recommend this trail though don't try it with road tires yet. The surface will tear them up. It will probably be fine in a year or two for any kind of bike. 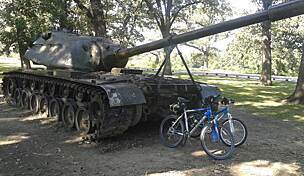 "I rode 26 miles from Annawan west to Colona on Oct. 8, 2002. The trail was open and freshly surfaced with chip and seal. Work was in progress on aqueduct six which required a small detour. There were small parks at some of the locks with restrooms. 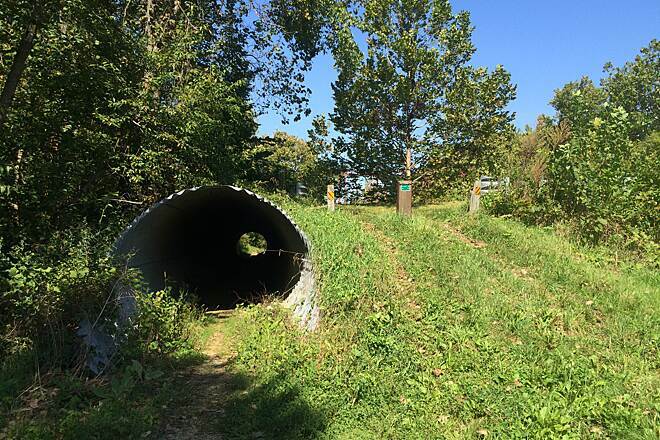 A call to the DNR trail office revealed that the trail is nearly complete but not officially turned over to the state park system. Yet it is open for riding." This portion of the trail was fantastic. We were happy to find the trail has a new surface of tar & chip. We had to watch for loose gravel periodically but it was a very nice ride. The trail lacks markings so our source of information came from local fishermen. We took plenty of water becuase of the heat but next time will probably take food because this stretch of trail lacks places to stop for refreshments. Hopfully there will be samll signs in the future to guide us to such facilities. We plan to make the one hour and twenty minute drive to ride this trail again soon. 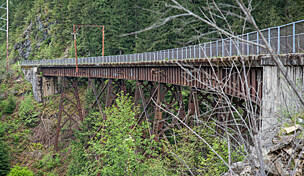 "as of early june, the condition of the trail was worse than you described. On mown grass one can bike... but the grass is gone and you'll sink to your hubs in the mud... been there and done it. not a pleasent ride." Crushed stone now? Or still grass? 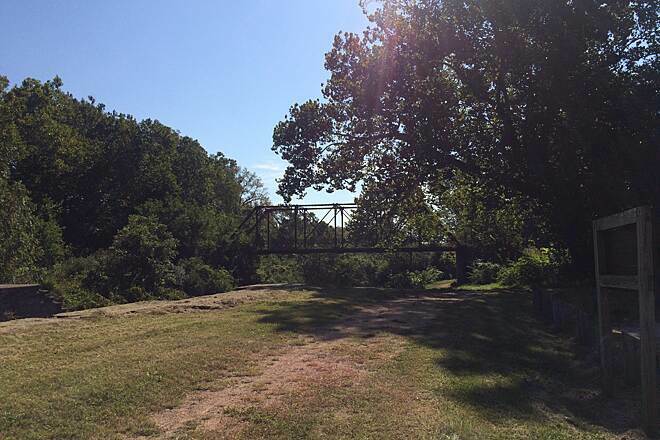 "I would appreciate an update on this trail, which is part of the Grand Illinois Trail. When I last checked, the trail wasn't crushed stone, at least in the spots where I checked it on an auto trip. It was just a grass bank, suitable for mountain bikes (as long as there weren't enough mountain bikes to wear out the grass). doesn't route you on this trail at all, but on parallel roads, making me think this segment may not be finished as of August, 2001. If you know of contrary information, please post it in a corrected review here, so visitors will get current info."